This part of the guide also provides information about exceptions to the copyright law that apply to instructors including the TEACH Act and the Classroom Use Exception. Finally, there are a couple of tools you can use to help determine if your use is fair or covered by another exemption. Does my use exercise one of the exclusive rights of copyright? If not, copyright doesn't come into play. For example, if you are simply linking to legal material available freely on the web or in a licensed library database, you are not invoking copyright. Is the material I want to use covered by copyright? Most material is protected. If the material is in the public domain, belongs in a category unprotected by copyright as described above, or was produced by the Federal government, you are probably clear to use it. 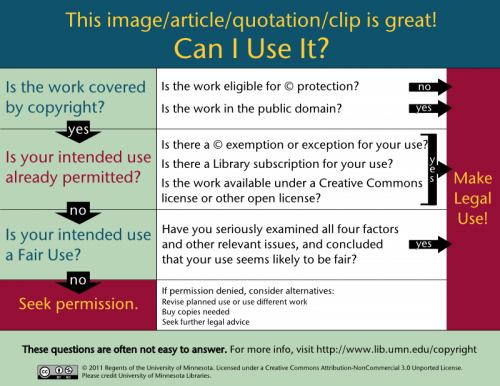 Once you have determined that copyright will come into play, figure out if your use is permitted by an existing exception (like fair use, the Classroom Use Exception, or the TEACH Act). If so, you can use it legally. When thinking about these exceptions, it can be useful to keep in mind that, in the face-to-face classroom, the two exceptions that are likely to apply are the Classroom Use Exception and fair use. In the online classroom, most often you will be looking to apply fair use, though in some cases the TEACH Act will apply. If you have determined that your use would exercise one of the exclusive rights of copyright, the work is copyrightable and still under copyright, and no exception applies to your use, you will need to seek permission at that point. The U.S. Copyright Code provides for the educational use of copyrighted material without the permission of the copyright holder under certain conditions. Use this free online tool developed by the American Library Association to find out if your intended use meets the requirements set out in the law. This tool can also help you collect information detailing your educational use and provide you with a summary in PDF format. When the Classroom Use Exception applies to your situation, as it does in only limited cases, it is absolutely clear regarding the rights it gives you. Remember that this exception does not permit copying or distribution. Remember that copyright is actually a "bundle" of rights. This exception gives you the right to use just two of the rights in that bundle: performance and display. This means that the classroom exception does not give you the right to make copies and hand them out or to make a copy of an image in order to display it. It is also very important to remember that this exception only applies to teaching that happens in person in a classroom setting. It does not apply to course websites, synchronous or asynchronous online instruction, or any other mode of instruction where all of the participants are not joined together in person in a classroom (or classroom-like) setting. You may be wondering why the laws that apply in the physical classroom don't apply in the online classroom. The short answer is that, as distance education began to become commonplace, there was an effort to update the Classroom Use Exception that we as educators have always relied upon to give us broad latitude to display and perform copyrighted materials in our classroom to apply to the distance education classroom. There was great fear on the part of content owners that digital copies of their works in online classrooms would lead to widespread piracy. Thus, the TEACH Act was born. TEACH is wonderful when it works because it does provide clarity about whether our use is legal. On the other hand, it definitely imposes much greater restrictions on the online instructor than are felt by the face-to-face instructor. Keep in mind, the only part of the law that really differs between the distance classroom and the face-to-face classroom is the Classroom Use Exception. Online instructors still benefit from fair use and, in many cases, we can make fair uses of materials that would not meet the extensive requirements of the TEACH Act. You are teaching at an accredited, nonprofit educational institutional or governmental body. You have an institutional policy that addresses the use of copyrighted materials and promotes compliance with U.S. copyright law. You as the instructor are individually responsible for copyright compliance. Your institution provides educational resources that accurately describe copyright protections and responsibilities. Your institution has implemented reasonable measures to prevent retention of the works for longer than the class session. Your institution has implemented reasonable measures to prevent unauthorized further dissemination by the recipients. There is a notice accompanying the work notifying students that the work may be protected by copyright. If the work is a non-dramatic literary or musical work, you can post entire works. If the work is a dramatic literary or musical work, you can only post "limited and reasonable" segments. The work is an integral part of the class session. The work is part of systematic mediated instructional activities. This means you will facilitate the students' use of the work. The work is directly related and of material assistance to the teaching content. You will display an amount comparable to that which is typically displayed in the course of an in-person classroom setting. You will only make the work available to students during the relevant instructional module. It should not be available for the entire length of the course. The work will only be available to students who are enrolled in the course. The work was lawfully made and acquired. The work was not created as a digital educational work. If it was, the TEACH Act does not apply. The work is not a textbook, course pack, or other commercial educational work. If this is a title students would otherwise be required to purchase for your class, it will not be covered by the TEACH Act. There is no reasonably priced streaming version of the work available to the institution. Yes, this is quite a list! If your use and material meet all of the criteria above, congratulations! Your use is protected by TEACH. TEACH is great when it applies because it gives you the peace of mind that comes with knowing in clear terms that you are not making an infringing use. If your use does not meet all of the above criteria, don't despair! Your use might still be a fair use. Fair use doesn't always offer us the same peace of mind, but it makes up for it by being a flexible and dynamic doctrine designed to support a wide variety of beneficial uses of copyrighted material. Legal Disclaimer: The information provided in this guide is for general reference purposes only and should not be construed as legal advice of any kind. If you require advice in relation to any specific copyright issues, you should consult an appropriate legal professional about your particular situation. This page was created using material from Portland Community College Library's page, Copyright Resources, and is licensed under a Creative Commons Attribution-ShareAlike 4.0 International License license.